Yes, you can write what you’ve been wanting to write and love the process. This FREE 33 page eBook will give you the seven steps to write with both power and ease. Whether you’re writing for yourself or for audiences of thousands, whether you’re writing explicitly about your life or not, this unique method will unleash exciting new dimensions in your writing life so that you can write your most powerful work! 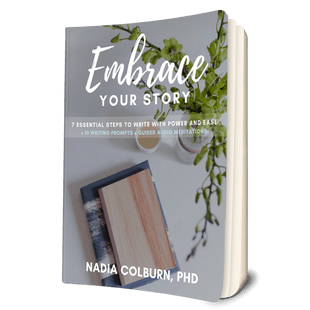 In addition to the seven essential steps, this free ebook contains more than 20 exercises and writing prompts and two free 15 minute audio meditations for writers. I have an academic background in literature and creative writing–I have a BA from Harvard and a PhD in English from Columbia University and by my early thirties my creative writing was getting published in places like The New Yorker. I’ve now published poetry and prose in more than 80 national publications, including Spirituality & Health, American Poetry Review, Boston Globe Magazine, slate, Lion’s Roar and many other places, and my debut poetry collection, The High Shelf, is forthcoming in 2019. But those fancy resume lines are only a small (and I think least important) part of who I am. I’m also a serious student of Thich Nhat Hanh, a Kundalini yoga teacher, an activist for peace, equity and the environment, a mother and wife, daughter and friend, and writing teacher and coach. And I’ve done my own fair share of personal healing and growth. I believe that everyone’s voice and story matters, and I help women (and some men) embrace the full power of their voice for a more just, sustainable world. I have seen that our inner work and our outer work must go hand in hand to get optimal results. I’ve seen how my students’ confidence, creativity and craft have grown, and how they have had transformations on and also off the page. I’m excited to begin to share this process with you!